There are a million ways to display and organize everything from books to trinkets, but wall shelves pick up “stuff” off the ground and tidy up nooks and crannies. These can be found under bookshelves ideas and book storage as well as wall shelving. But instead of using the plain traditional, wooden pieces that are seen in every house, we’ve found some stylish and modern ideas that would not only help organize, but bring a bit of fashionable interior design into the home. 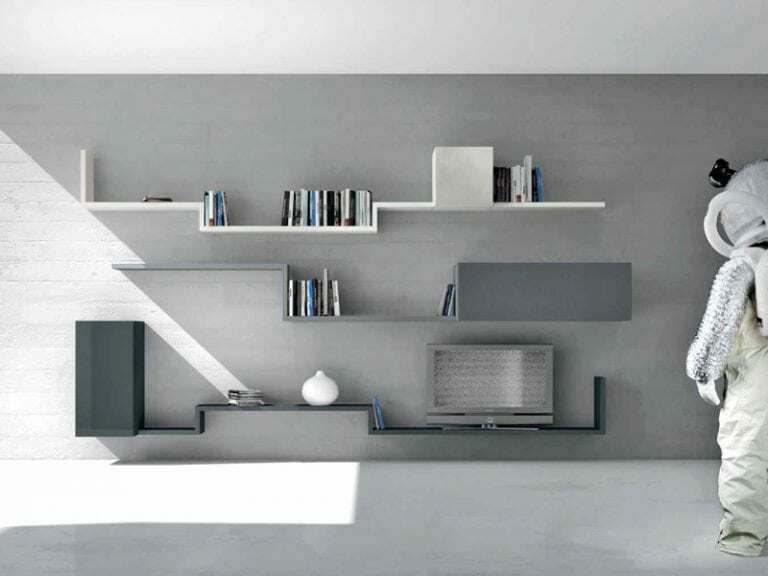 Let’s have a peek at 15 Cool and Contemporary Designs for Wall Shelving Systems, that can update and beautify your home’s living room. Don’t you just love these whimsical, circular pieces? They are definitely outside the box in terms of traditional design, but they’re functional making them such a great option. We see these fitting anywhere from a dining room to a master bedroom. Here are a fun and edgy idea that works not only as display work but as artwork too. We are in love with the funky, modern style and it works great in so many spaces. And we see this working fantastic inside dorm rooms, studio apartments, and playrooms. Adding a bit of unique, personal style into a bedroom is always a good idea and it’s even more wonderful when it comes in surprising ways like in this example. This idea is like a tree from a fairy tale that holds books for late night reading. Even your wall can bring in a bit of pizzazz and appeal, just take a look at this cactus-inspired design! Not only will it do the job of holding the family photos but it’ll dress up any nook or cranny of the house. It’s an instant focal and conversation piece too! This may also be considered to be a family tree. It’s nice how it organizes all the photos rather than just an ensemble of photos adorning a wall that can often look too crowded. A personal favorite of the entire list, the interest, and texture of this system is stunning. The combination of colors, which are a bit hipster and definitely on trend are a great way to bring in new life into the home. And what’s so beneficial about this system is all the extra spaces you can utilize and decorate with! For something that fits in a more traditional and rustic of spots consider this idea for inspiration. The industrial, mixed material feel adds interest and stylish appeal to even the most minimalist and masculine of spaces. This would fit great inside a home office or even in the infamous man cave! Sleek, sophisticated and functional too, we are loving this modern a slender example. They have a bit of fashionable flair with the slight details but they’re also very posh and elegant as well with their smooth lines. It’s perfect for media storage but also a great way to display trinkets and decor pieces too. Not all systems have to “stick together.” This picture is more of a mixed and matched feel. It’s traditional and a bit “zen” inspired, which we love, but it’s also very contemporary with its puzzle piece finish. The chocolate brown finish also helps for blending into a variety of different spaces. Here’s a futuristic contemporary look if we’ve ever seen one. Use all your floor room and keep everything off the floor with all this space for organizing. The slate, haze and white colors keep it modern while the smooth lines complement the contemporary feel. It definitely helps to utilize any room its in, even the small ones with less closet space. From big to small, this cool space combines so much style and trending fashion that we’ve instantly fallen head over heels. Mustard color with a balanced design, it will help any room look complete, neat and on trend. Again, it’s a sleek and modern look that works in so many rooms from the breakfast nook to the home office! Here’s another personal favorite from the entire list, this geometric example acts as both function and art in this neutral covered living room. Clean lines and smooth edges never looked so feminine than this. We love the combination of girlish charm and contemporary flair. Similar to the piece just above, this system is even edgier than its above counterpart. And unlike the design above, this example has a more masculine essence but still a very artistic quality that we find intriguing and inviting. The multi-color theme also makes it a more youthful and vibrant experience. How adorable in this orange person on the run? It’s absolutely perfect for a child’s playroom or bathroom area. It keeps everything neat, tidy and full of personality. And, of course, it keeps the floors clean which can create more room for play! This piece evokes such a playful and youthful vibe that couldn’t see this in a home without some little ones! Simple and sweet, this white, modern and wooden wonder works in any type of home and nearly any style theme you could imagine in a contemporary mindset. We love the shape, sharp lines and of course the crisp, neutral foundation which makes it perfect for blending. At first glance, this shelving unit looks like a simple, modern bookcase. But, remember, these designs don’t have to be used just for books. Instead, you can use them for a variety of different types of decor pieces or nick-knacks around the house.